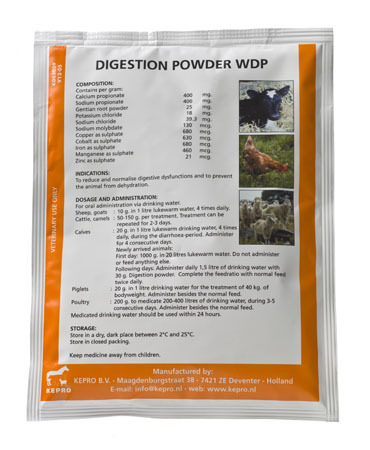 Digestion Powder wdp is used to reduce and normalise digestive dysfunctions of sheep, goats, camels, cattle, calves, pigs and poultry. The product is also used in cases of scour, to prevent the animal from the process of dehydration and loss of electrolytes and to minimise nutritional stress caused by change of environment. It may be used on its own or in conjunction with antibiotics and/or chemotherapeutics. 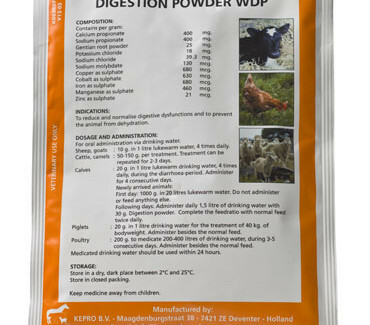 Digestion Powder wdp is indicated to reduce and normalise digestive dysfunctions and to prevent the animal from dehydration. Sheep, goats : 10 g in 1 litre lukewarm water, 4 times daily, during 5 days. Cattle, camels : 50 – 150 g per treatment during 2 – 3 days. Calves : 20 g in 1 litre lukewarm milk replacer, 4 times daily, during 4 days. First day: 1,000 g in 20 litres lukewarm milk replacer. Do not administer or feed anything else. Following days: administer daily 1.5 litre of milk replacer with 30 g Digestion Powder wdp. Complete the feed ratio with normal feed twice daily. Piglets : 20 g in 1 litre of drinking water for the treatment of 40 kg bodyweight. Administer besides the normal feed. Poultry : 200 g to medicate 200 – 400 litres of drinking water, during 3 – 5 days. Medicated drinking water should be used within 24 hours. Medicated milk replacer should be used within 12 hours.